"On The Horizon" artist Rachel Kays! from this young artist from Austin, Texas! Keep it rollin' and we're looking forward to more from Rachel... pick up a copy of her debut release "Natural" by clicking on the link below. A perfect add to your collection." Not many three-year-olds tell their parents exactly what they were born to do and then fulfill that statement by the age of 16. Rachel Kays wasn't your average toddler and she's not your average teenager either. She has sung since she figured out how to make sounds, was re-arranging 'Twinkle, Twinkle Little Star' at age 3, and released her first EP of original music on her 16th birthday. 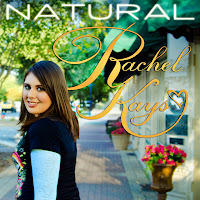 Her debut album, NATURAL was released on 5/11, and its eleven tracks show the diversity of Rachel's style, her incredible vocals, and the youthful innocence of her lyrics that listeners of all ages will enjoy. Her sound is unique, yet her themes are familiar to many, paving the way for a long and successful career doing what she loves to do. Rachel has already entertained tens of thousands of people in her 16 years. From singing the National Anthem before crowds upwards of 14,000 to impromptu concerts for friends and family, she has never shied away from the spotlight, making the front page of her hometown newspaper twice before she was 12 years old. It wasn't until she got her first acoustic guitar at the age of 14, however, that she realized she had a knack for composing as well as performing. After teaching herself a few chords using youtube videos, she started churning out songs at an unbelievable pace - that guitar really released the creative energy within! Less than a year later, she had written more than 35 songs and her parents knew that the time had come to start a recording project. Rachel has been accepted as an ASCAP Composer and recently performed at the Nashville Palace in the Music City USA Showcase in Nashville, TN during CMA Fest.